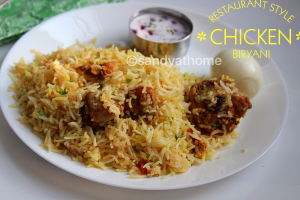 Chicken biryani is most loved and most sort after one pot meal. 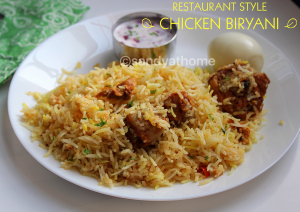 So bringing in the blog one such chicken biryani prepared in dum method just like restaurants. 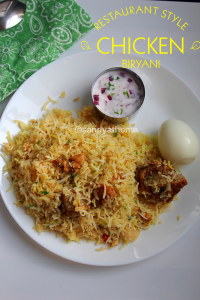 Okay why biryani amidst the festival spree? Because its THANKSGIVING and I want to thank all my viewers so thought to share a special recipe that I relished recently. I happened to taste this biryani in my close friends house few weeks back and just fell in love with that biryani. So I got this recipe from her and she said she got it from internet. From wherever the recipe came it just turned out perfect when I made it this week and cant thank you enough mythili. The preparation is very easy though the ingredients list looks long. 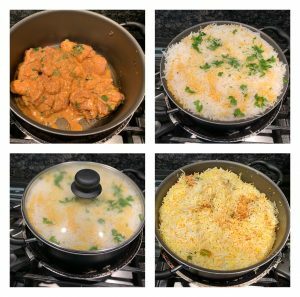 I have post many biryani varieties earlier in the blog and this particular recipe is little different from all others in preparation as well as in taste. 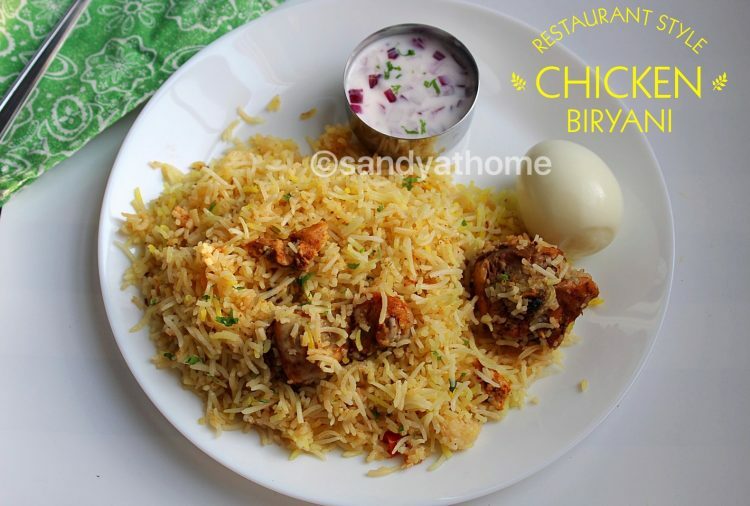 The most special and secret ingredient about this biryani is the homemade biryani masala which talks for itself through flavors, aroma and taste. Just elevates the level, color and taste of the biryani. Actually to the recipe I added lots of ghee which made the biryani taste like the one we find in restaurants. I am not going to reveal the name here anyway😂 because we can make it at home now. For this recipe i used both chicken drumsticks and chicken breast tenders because of which the cook time is 15 minutes more, if you use just breast tender pieces it will be cooked more quickly. But you can add any piece of your choice but make sure to alter the cook time accordingly. So lets get to the making! Wash and clean chicken. 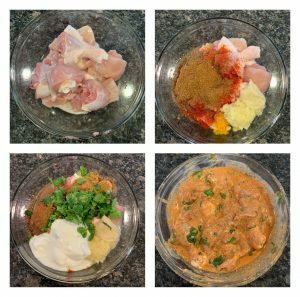 In a bowl add washed chicken, ginger garlic paste, salt, chili powder, coriander powder, biryani masala powder, turmeric powder, curd, chopped cilantro, mint, green chili, kewda water and lemon juice. Mix well and marinate chicken for 2 hours at least or overnight for best results. Wash and soak basmati rice in water for 30 minutes. Now in a vessel add water, few mint leaves, oil, cloves, cumin seeds , salt and bay leaf ; allow it to boil. When the water starts boiling add the soaked rice and cook till 60% done. Now on a tawa place a heavy bottom pan. Heat oil in that heavy bottom vessel add oil and the marinated chicken over that add 60% cooked basmati rice and garnish it with chopped mint, chopped coriander and ghee. 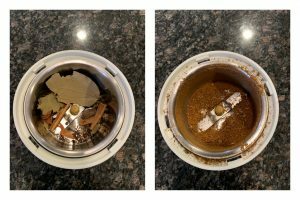 I mixed ¼ tsp turmeric with 3 tbsp hot water and drizzled it over the rice for color, this step is optional, you can add edible food color too. Cook in hight flame for 5 minutes then in low flame for 30 minutes or until its done. Do not open dum immediately allow it to rest for 15 minutes without any flame. when done fluff the rice gently and serve it hot with raita of your choice! In a blender add all the whole spices mentioned under the title ingredients for biryani masala and blend it into powder. Wash and soak basmati rice in water for 30 minutes. Now in a vessel add water, few mint leaves, oil, cloves, cumin seeds , salt and bay leaf ; allow it to boil. When the water starts boiling add the soaked rice and cook till 60% done. Now on a tawa place a heavy bottom pan. 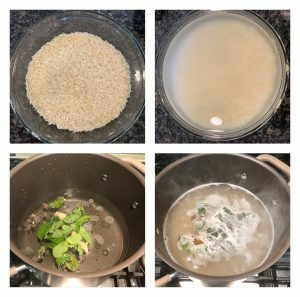 Heat oil in that heavy bottom vessel add oil and the marinated chicken over that add 60% cooked basmati rice and garnish it with chopped mint, chopped coriander and ghee. I mixed ¼ tsp turmeric with 3 tbsp hot water and drizzled it over the rice for color, this step is optional, you can add edible food color too. Cook in high flame for 5 minutes then in low flame for 30 minutes or until its done. Do not open dum immediately allow it to rest for 15 minutes without any flame. fluff the rice gently and serve it hot with raita.